in a place where you don't have to do anything. If you are an early bird or sunrise addict anyway then you are most welcome to join our breadbakers at 5:30 am every morning for a lesson in crafting some very fine loaves. We love warm fresh bread and have been baking our own since 2010. On Sundays you can even try your hand at the braided Zopf that Rahel bakes (yes she is Swiss). Naturally during early activities you will need a good dose of filter coffee. Every morning you can get unlimited free filter coffee while enjoying the sunrise over Lubanzi beach. Yes, you read that right, it's free - and so is the sunrise. Our deck offers the perfect place to perch yourself for this experience. Dolphins and whales playing out at sea are frequent but not guaranteed. 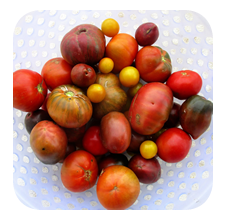 Our very first love is gardening and putting super fresh food on the table. 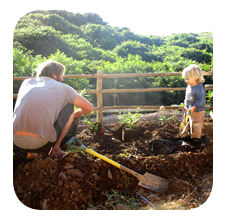 Our organic vegetable garden is a big open canvas for us to create sustenance. You are welcome to join us in picking your lunch or dinner or helping out with some weeding if you are experienced. You are also welcome to just sit and relax and experience something green in our garden. We love making food (Rahel hates cooking but loves cheese) and all our meals are home made as far as possible. 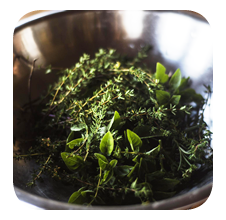 We harvest most herbs and vegetables from our organic garden, therefore our ingredients are super fresh. Our salads are a true delicacy and our food is as delicious as possible. If you happen to be here on the burger evening you can be sure that we have just baked the rolls, made the patties from scratch, the potatoe wedges are hand cut and the salad has just been picked. We also offer vegetarian and vegan options and we are happy to cater to any special requirements. Our bread is baked daily and our salads for lunch are fresh from the garden. The stars here are amazing! There is almost no light pollution so at new moon they truly look like they are falling from the sky. Every night if you watch long enough you will see shooting stars. You are welcome to grab a blanket and tuck yourself into a hammock or drag your mattress onto the deck and sleep under the stars. Wood is a rare thing in our area but every now and then we light up the fire and tell tales of our travels. Some of those nights we have a braai and those are the best! On some very special full moon nights we hunt the village for wood and have a bonfire. Fire is a way of life in the village and it is used to cook, to keep warm and to inspire storytelling. Join the fire! Here we believe that the best time to plant a tree was 20 years ago, the next best time is now. We have planted hundreds of trees at Lubanzi and enjoy it every time we do. Our nursery has lots of baby trees that can't wait to get their roots into the soil. 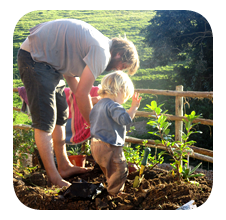 You are welcome to plant your own tree right here in our village whenever you feel the need - we will gladly supply the tree! Once upon a time there was a dream that food was to be free. We joined that dream as best we could and you are welcome to join us for lunch any day for free. You are also welcome to create that lunch and invite those around you to partake in said lunch. We will provide ingredients and the space. If you have a moment look up the Food is Free movement and create your own project, there are so many ways we can make this happen! Feeling lazy? Grab a book from our book exchange, find a cozy spot and lose yourself in a different world. Rainy days? Ask the staff to teach you how to play Wild Lubanzi Dog. It's a fun, strategic card/board game that will keep you entertained for hours. Caution: it's highly addictive! Walking the Wild Coast is the best way to get a real feel for the place. The hilltop lawns have been kept manicured for your convenience by the local sheep and cows. Its perfect, you can roll up and down them or just sit and watch the sea or village life. There are spectacular Aloe Ferox forests that are hundreds of years old or clifftops that will take your breath away. 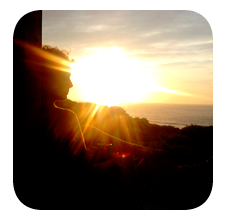 There is a special hill above the beach that is most perfect to perch yourself on while watching the sunset or sunrise. Lubanzi has some spectacular sea caves that you can visit during low tide. They have been worn into the cliff face over thousands of years. There is even one you can swim into, called the mermaids cave. Ask us for details on where and how to explore these hidden secrets. The Sardine Run on the East Coast is one of the most spectacular experiences on earth. The whales come to feed on the sardines from June through to late November. 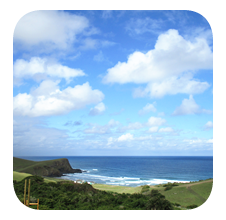 The hills around Lubanzi make for some of the best land based whale watching in South Africa. The whales also use the bay to calve in and you will often see mothers and babies all through winter and spring. And nope, those are not gun shots that you hear - it's the whales whipping their tails onto the water, or slapping each other. They are often so close that you can hear the mothers singing to their babies. The dolphins are around all year round but during the Sardine Run they are here almost every day. 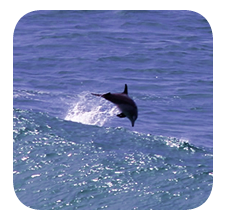 They play in the surf break at Lubanzi beach and you can often see them doing back flips and surfing. A few guests have braved the distance and swum out to play nearby. There are a few rocky outcrops where the dolphins come to within meters of you. This bay is one of the most spectacular places to see dolphins. 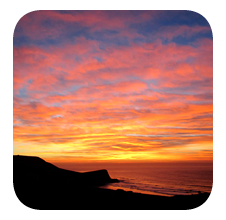 There are so many beautiful evenings on the Wild Coast and we often head off to the sunset hill that overlooks the beach and Lubanzi village. Grab a cold one and jump onto Spa's 4x4 for a lovely little ride up the hill. If you have the urge to use your feet then round up a few friends, borrow a backpack and load it up with some beers for a 10 min walk to the sunset site. There are so many lovely warm evening and we often head down to the beach in the evenings to catch a glimpse of the phosphoresence in the waves or just to experience the sounds of the night. On full moon nights the whole bay is bathed in a silvery luminesence that is truly magical! It's a little too much to try and describe it so we will just leave it to your imagination. A Shebeen is a small bar/tavern were you can sometimes find cold beer, but mostly find the home brewed maize or sorgum beer prepared by generations of Xhosa brew masters. It is a unique experience where you can get to know the somewhat tipsy shebeengoers who will be happy to share their jug with you. You are welcome to ask for assistance in locating these fine establishments. The communities all over the Wild Coast absolutely love soccer. Here it is called football or just ball and almost every child grows up playing ball. The young children use plastic shopping bags that they upcycle to multiple layered balls. The professionals in the village form teams and compete on weekends in full uniform. You can join on friendly games or watch as professional teams from around the country visit their home town to play against local teams and scout for the next South African super star. Donations are welcome as new balls, uniforms and boots are always needed. The round houses in the village are called Rondavels and are made out of mud, cow dung and chopped grass. Most building is done in winter and the bricks are made from autumn onwards through winter. Building season ends around October when the rains start. This is the most sustainable form of building in the area and an amazing skill to learn as it can be applied almost anywhere in the world. You are welcome to join the families as they make the bricks. This involves digging, carrying water, collecting cow dung, chopping grass and forming the actual bricks. 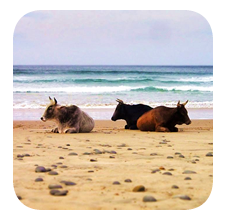 It is lots of fun and a great way to immerse yourself in the Xhosa culture. 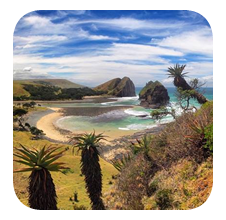 South Africa has some of the most beautiful iconic locations in the wold. 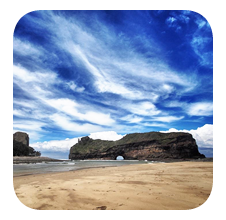 Hole in the Wall has to some extent come to represent the splendor of the Wild Coast and its natural beauty. Hiking from the Lubanzi side offers a unique entrance into this stunning environment. The clifftops offer the perfect perspective to view whales, dolphins and the birdlife that follows the Sardine Run. Endless rolling hills form the backdrop for rural villages and lovely people who live here. Take a day pack and head out on this 3 hour return hike from the backpackers. There is a little beach just 10 minutes walk from Wild Lubanzi Bacpackers. Hardly anyone visits it and most of the time you have it all to yourself. There are also some beautiful rock pools along the rocky shore near the Lubanzi caves that are just perfect for a dip. We are sure there are more secret spots and that you will find them and make them your own. There is a beautiful river estuary just 20 min walk from the backpackers. The riverbanks offer a great spot to fly fish from, or you can convince one of the village kids to teach you how to use the fishing poles they have hand crafted. There are a few Fish Eagles nesting on the cliff face upriver and sightings are common. You are welcome to borrow a lylo and paddle up river or just put your towel down or hammock up under a trea and take a nap. Just up the beach from the estuary are a grove of milkwoods gowing right on the edge of the sand. They are mostly red milkwoods that form the stability for the small dunes along the coast. A little further in you can find the larger leafed white milkwoods. These trees are protected in South Africa and can live hundreds of years. The Xhosa communities eat the little red berries and apparently this is sometimes added to the locally brewed beer. During the Sardine Run the birdlife at sea is spectacular: gannets and other sea birds feed off the abundance of fish that are trapped along the coast in the cold currents. The Wild Coast is also one of the few places where you can view the ground hornbill that is now endangered. There is an abundance of other birdlife and this makes the Wild Coast one of the top birdwatching areas in South Africa. Have your own 4x4? Then you have the perfect oportunity to test out your low range as you wind your way down to Lubanzi. The road is rough and if it rains your skills will be tested to the max. Don't have a 4x4? Then don't drive down, you can take Spa's friendly shuttle service in his very old Toyota Y Series. Its the cheapest 4x4 experience you will ever get! If you want to experience a bit more or test your skills then just let him know and he will give you a lesson for R150 per hour! You don't have to be a patient to visit Zithulele Hospital. This is one of the main health care centres for hundreds of thousand of people and facilitates the outreach programs and care programs to clinics around our area. There are various universities that send students on week long assistance programs and if you are a healthcare student or professional you are more than welcome to ask us for the contact details or the organisers. If you have any other NGO/NPO experience then you can contact the organisations that operate around the hospital and see if they have space for you to lend a hand. The local MiniBus taxis are the best way to get around the Wild Coast. They are super cheap at about R0.75 per km and the music comes included! The ones that drive to and from Zithulele are good quality Toyota Quantums. Most of the community members in our area make use of this lovely service. You will be in the taxis with families from all over. Learn some Xhosa and chat to the drivers about the area - most are super helpful and friendly no matter how big your backpack. If you are entering or leaving the Wild Coast make sure to stop at either Qunu or Mthatha to learn more about Nelson Madela and his role in our democracy. The Museum in Mthatha is newly refurbished and has been open since early 2017. 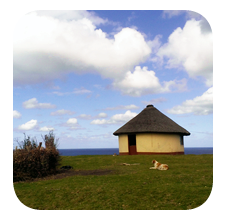 Near Qunu is where Madiba built his home; it is a replica of the house he first lived in while under 'house arrest' after he left jail. It is right next to the N2 and can easily be viewed when driving past. His grave site where he was laid to rest is just north of the house and can also be viewed from the N2. The site will be opened to the public in the near future. If you are on the way to Joburg make sure to visit the Mandela 'Capture Site' and the Apartheid Museum. Unfortunately the Red Museum in Port Elizabeth is closed but you can visit Robben Island when in Cape Town.